Solar scientists have confirmed that Tuesday's explosion on the Sun was, by far, the biggest flare ever recorded, capping an energetic solar period. In the past fortnight, space weather forecasters have been busy tracking the impact of geomagnetic storms on Earth. 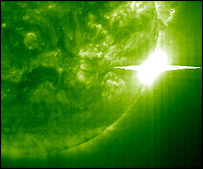 Astronomers say that Tuesday's flare was by far the biggest ever observed. There had been a build-up to it with an X8 and an X3 event on Sunday. And on Monday, there was an X3 flare followed by smaller ones. The previous week had seen X17 and X10 events that took place back-to-back. Tuesday's flare went off the scale; at the time researchers said it was "well above X20". A precise description was difficult because some monitoring satellites were briefly blinded by the scale of the event. Now, scientists have had time to asses its importance, classifying Tuesday's event as X28. 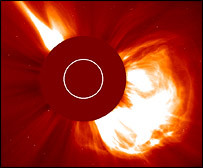 The associated coronal mass ejection (CME) came out of the Sun's surface at about 2,300 kilometres per second (8.2 million km/h). Only part of the CME was directed towards Earth. The major flares have come from sunspot region 486, now officially the most active solar region in recorded solar observational history. Many times in the past two weeks, skywatchers have been on alert for spectacular aurorae in darkened skies. These dancing polar lights are generated when fast-moving particles (electrons and protons) ejected from the Sun get trapped in the magnetic field around the Earth, and collide with the gases in the upper atmosphere.